Morphology is the study of shapes. In the context of polymeric materials, morphology describes the distribution of phases within the material. In general, polymers tend to exist as amorphous solids. Unlike metals or ionic solids, their components are not found in ordered layers or rows; those long chains don't line up nicely, but they get all tangled up instead. Whether in the glassy state or the rubbery state, the polymer chains aren't organized. Oligomers -- smaller molecules made of just a few monomers -- crystallize more easily because their chains are too short to really get tangled up. If they are cooled down from the liquid phase, they can get arranged into orderly rows and form crystals. Well, in reality, short sections of polymer chains can act like oligomers. If a polymer is cooled down from the melt, several parallel lengths of chain might actually settle into a crystalline pattern together. However, at some point one or more of the chains will get twisted up, bringing this ordered section to a halt as it trails off into an amorphous mess. Frequently, polymers contain small "microcrystalline domains" surrounded by "amorphous domains." Most of the chains are tangled up, but little sections of them are crystalline. This type of phenomenon is called "microphase separation"; the material is not actually in the same phase all the way through. Microphase separation is particularly important in copolymers. Sometimes, two different blocks don't completely mix together in the solid state, especially when doing so would disrupt strong interactions between the chains within one of the blocks. Maybe one of the blocks is actually more crystalline than the other. In that case, the different blocks might microphase separate into crystalline and amorphous domains. That kind of behaviour can be very useful. 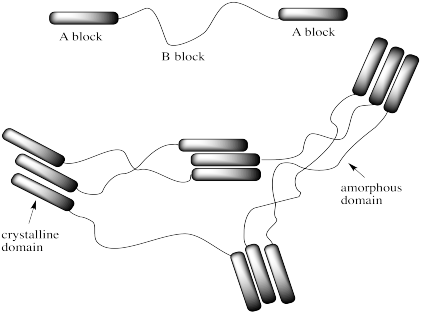 The amorphous domains are very flexible. Those chains can be stretched and twisted without much problem. The crystalline domains, on the other hand, are very strong. They are like anchor points within the structure. Together, these two structures combine to make something that can be stretched, but only so far before it will snap back. They could make an elastic material, or an elastomer. In many cases, the phase separation isn't between a completely crystalline and amorphous domains, but between a glassy domain and a rubbery domain. In that case, it's the same concept: parts of the material flow easily, whereas other parts do not. The latter segments hold the material firmly in place and help snap it back to its original shape after stretching. The following ABA triblock copolymers can be used to make chewing gum. In each case, identify the part that would form the more amorphous microphase and the part that would form the more crystalline microphase, and explain your reasoning.